Aluminium vs uPVC windows – which is best for your St Albans home? Two of the best materials for windows are aluminium and uPVC, but which of the two is the better option for a St Albans homeowner? The answer to that question is entirely dependent on your preferences and priorities but let’s try and break it down. Obviously, you want your windows to last a long time as they’re a fundamental part of your home. Both aluminium and uPVC are very durable and will last you quite some time. uPVC is resistant to rot and requires little maintenance but there’s a chance they’ll degrade and require replacement after around 30 years. Aluminium is a slightly more durable material than uPVC and therefore lasts longer, with an average life expectancy of 45 years. The security of your windows is of the utmost importance as you don’t want any unwanted guests to find their way into your home. Just like with durability, both aluminium and uPVC are strong contenders and you really couldn’t go wrong with either of them. When it comes to the security of windows, the locking system you have factors significantly, but thankfully, every product from Budget Windows is as secure as can be. In the past, aluminium windows were seen as inferior to uPVC when it came to energy efficiency as heat would pass through it with ease. Nowadays, with the wonders of modern technology, aluminium windows have thermal breaks within the frames and they utilise other clever techniques to ensure they’re as thermally efficient as can be. Whether you get aluminium or uPVC, a window from Budget Windows will certainly keep your house warm. Everyone deserves to take pride in the appearance of their home. The better-looking window out of aluminium and uPVC is entirely subjective but it should be noted that a large reason that aluminium windows have risen in popularity is thanks to their unique style. Aluminium windows are able to have slimmer frames than uPVC, which works perfectly for those looking for a minimalist design. This also allows you to have a less restricted view from your window and allows for more sunlight to be let in. One aspect you might not have considered when it comes to choosing windows is their soundproofing qualities. The value of being able to block out the noise from the outside world shouldn’t be overlooked. This is one of the few areas where uPVC beats aluminium as it has better insulation capability and can, therefore, block out sound more effectively. If you live in an overly busy area, you might pick uPVC over aluminium for this very reason. Your financial situation will more than likely play a part in your final decision so it’s important to know that aluminium windows tend to be more expensive than uPVC windows. This is because the manufacturing costs for such a material are costlier and the installers must then compensate for this. It could be argued that aluminium is more cost effective in the long run though, as it’s less likely to degrade than uPVC. No matter what kind of windows you’re looking for, Budget Windows only offers products of the highest quality. If it isn’t aluminium windows you’re after, you might be interested in our range of doors or conservatories. For more information, call us on 01727 832 333 or send us a message online. If you would like to find out more about our wide range of products, then get in touch with us today to request your free brochure. Get in touch with us to get a free quote on our range of products, or you can call a member of the team directly on 01727 832 333. Can I paint my front door another colour? 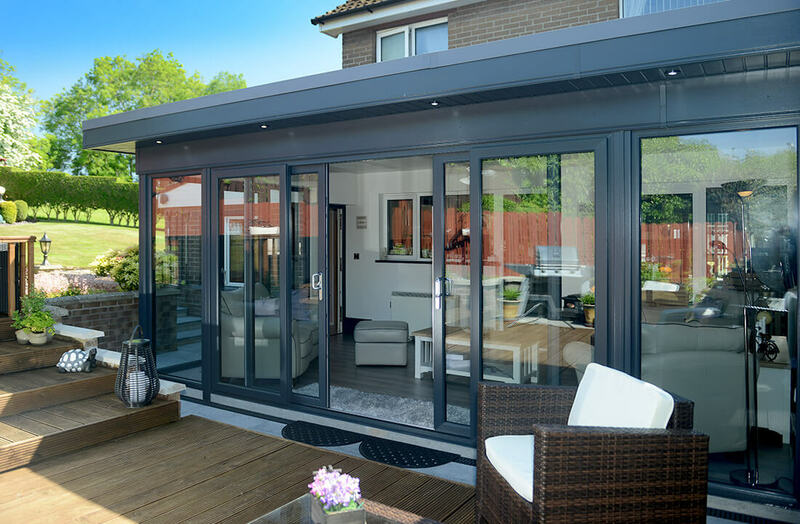 Are sliding doors cheaper than bifold?